March is National Social Work Month and OCES is proud to be a part of this celebration. 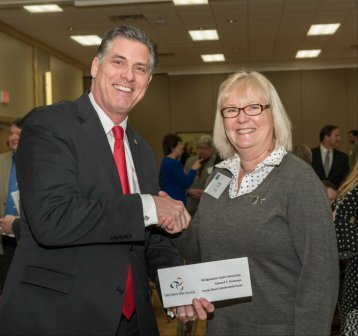 On March 20, World Social Worker Day, OCES pledged a $1,000 contribution to the Edward T. Donovan Social Work Scholarship fund at Bridgewater State University (BSU) in recognition of Social Work Month 2018. Edward T. Donovan was the Executive Director of OCES for almost 20 years. The scholarship was established to honor his memory. The recipient is a junior or senior social work major from Plymouth County or surrounding communities with a grade point average of 3.0 or higher. This year’s theme of “Social Workers: Leaders. Advocates. Champions.” highlights the role of social workers in helping the most vulnerable people in our society, as well as their role in improving the lives of all Americans. Every day the nation’s 650,000 social workers act as advocates, champions, and leaders who make our society a better place to live. Social Workers engage and bring together individuals, communities, agencies, and government to help society solve some of the most pressing issues of the day, including immigration reform; equal rights for all; affordable, accessible, adequate physical/mental health care; and protecting the environment. As part of the month-long recognition, OCES will celebrate the contributions of social workers and all OCES staff who work together to support our consumers, families and communities. OCES is proud to be an agency that provides independent, conflict-free assessments, care coordination, and administrative support for multiple in-home and community-based long-term services throughout our many different programs. Pictured here are Susan Willis, OCES’ ASAP Programs Director, and Frederick Clark, President of Bridgewater State University. The presentation was made during the MetroSouth Chamber of Commerce Legislative Lunch hosted on the campus of BSU.